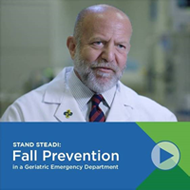 CDC has a new "Stand STEADI" video series highlighting healthcare teams and programs that are successfully implementing fall prevention. The first two videos of the series were released today, and feature (1) the first accredited geriatric emergency department at St. Joseph’s Healthcare System in New Jersey, and (2) a citywide strategy by Baltimore’s City Health Department to use real-time data to identify neighborhoods in need of fall prevention activities. CDC’s National Center for Injury Prevention and Control (Injury Center) announced three new extramural research cooperative agreements each of which includes an anticipated funding amount of approximately $3 million over four years. The Injury Center requested that applications focus on medication management of opioids and benzodiazepines to reduce falls among adults 65 and older. - Title: Implementation of a Medication Care Plan to Reduce Unintentional Injury among Rural Older Adults. - Title: Implementation of a De-prescribing Medication Protocol to Evaluate Falls in Older Adults. - Title: Reducing CNS-active Medications to Prevent Falls and Injuries in Older Adults.